By using calling our Freephone number you can start to make a shoulder injury claim today. We have a track record of winning the highest shoulder injury compensation payouts for our clients. Whether you have hurt your shoulder at work, in a car accident, or anywhere for that matter, then we can offer no-obligation personal injury advice. Call us today. No Win No Fee* Compensation for Shoulder Injuries – Whether it’s compensation for shoulder injury at work, pain arising from a car accident, or perhaps a sporting injury, we can offer quick and free advice on how much you could be awarded. Our call centre is open 24 hours a day and 7 days a week and our personal injury solicitors work on no win no fee*. We are specialists in claiming the maximum amount of compensation awards for our clients. That’s because our solicitors and lawyers have years of experience in handling similar cases. How Much Compensation for Shoulder Injury Claims? Depending on the circumstances of your injury (for example was it car accident, or at work), who was involved, how much pain you were, how it affected your daily life and work can drastically alter the amount of personal injury compensation that you could be due to receive. Please note that these numbers are purely based on examples and are used for indicative purposes. For a more accurate estimate you should call us today about your compensation for shoulder injury enquiry. Please note that we also specialise in related compensation awards for back injury claims and neck injuries. If you are thinking about using an online should injury claim calculator then stop right now. The reason we say that, is because unless you’ve spoken to an actual legal expert, there is no way you can realistically expect to be able to calculate the compensation award for a shoulder injury. That’s why we always recommend that you call our Freephone number to discuss a shoulder injury claim, as we can very quickly give you an indication of how much money you could be owed… and in some cases it will be much more substantial than the amount you see when using an online shoulder injury claim calculator. One of the more common claims that we give advice is for frozen shoulder. These types of injuries can be very debilitating for people, as it means you have limited ability to move your shoulder at all. Frozen shoulder can typically occur due to injury and sometimes even entirely different events such as diabetes, heart disease, and Parkinson’s disease. If you have hurt yourself during work and want to discuss compensation for a shoulder injury at work then it’s very likely that you are suffering from frozen shoulder. This will arise in most cases in those people involved in manual labour. Please visit the NHS website for more information on frozen shoulder. Injury compensation can be awarded, in most cases, although it’s very rare to find this type of injury in people aged under forty years old. If you believe that you have a shoulder injury that was due to a third party negligence, whether accident or employment conditions then you might have a case for compensation. It could be down to having to lift up heavy items over a prolonged period of time, so if your daily work has involved activities such as this then you could be a prime candidate for shoulder injury compensation. When you call our specialists, our solicitors will want to know as much detail as possible as they will need to present a legal argument that shows your employer and working conditions were liable to cause injury. We will then inform you on how much compensation for your shoulder injury as soon as we have the full details. We have created a short video about the process. You will need to have a full and proper qualified medical examination which will let us establish the extent of the injury as well as helping us also establish the probable cause. This process is key to winning all forms of shoulder injury compensation payouts. When it comes to assessing shoulder injury compensation claims then there are three main parts to the shoulder which will be assessed. We’ve gone into a little bit more detail below so you can help to decide on whether or not you should call us for compensation for shoulder injury enquiries. The shoulder blade is the most common bone to be injured. The medical definition for this bone is scapula. 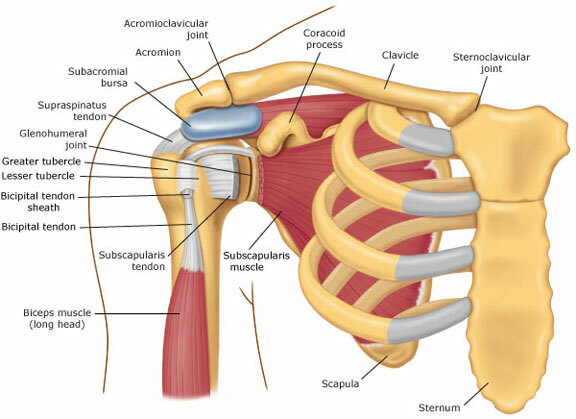 The joint in the shoulder also contains to more bones – the humerus and collar bone, also known as the clavicle. You can see how they all connect together on the diagram below. How all of the bones in your shoulder work and connect together. 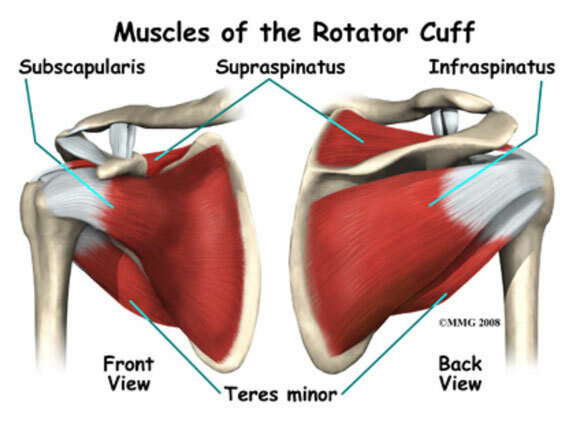 This is one of the parts of the shoulder that is at most risk of injury. It includes all of the tendons, ligaments, and muscles that are used in the shoulder movement. If these get damaged, or they suffer from being frozen, then you can be very limited in movement, not to mention in pain. Our personal injury solicitors have successfully helped clients with a shoulder injury claim relating to these types. Compensation for a shoulder injury at work due to rotator cuff pain. 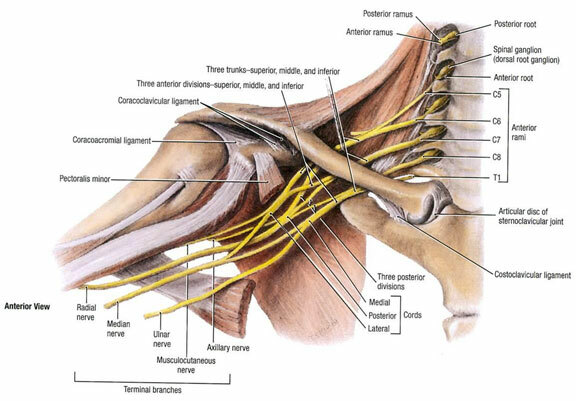 This is the part of the shoulder than contains the nerves. They connect the shoulder to the spine, neck, and arms. Where this can be subject to a shoulder injury claim is often after a car crash. The whiplash motion often suffered in car accidents will mean damage to the brachial plexus with victims exhibiting a tingling sensation in their shoulder. The Brachial Plexus can become affected in car accidents. Evidently accidents can happen anywhere and at any time. However, we do tend to find that there are more common types of incidents that lead to shoulder injury claims – we’ve highlighted some of them below. If you don’t see one that relates to your pain then please don’t worry as we can quickly advise on whether or not you can receive a payout. These accidents can occur anywhere and all different scenarios. You could be out shopping, walking down a public street, or working for your employer. If you fall over or fall down and injure your shoulder then you could suffer pain and damage. Broken bones, brachial plexus, and shoulder blade damage are all very common claim types that we deal with. Car crashes will vary in their severity, but in most cases there will be some form of pressure being applied to the shoulder and neck area due to the way in which accidents happen. Victims can suffer from whiplash, breaks, fractures, and other injuries. It’s very common for stiffness to develop in the shoulders after an accident, so in these cases you should seek legal advice if the accident was not your fault. Call us today to find out how much shoulder compensation you could be due. We also have a new section on the website dedicated to car accident injury claims. Those that work in a manual environment are in a high risk category. We have successfully won compensation for work shoulder injuries and help people with frozen shoulder and other ailments. If we can find that your employer failed in their legal responsibility to protect you from injury then you could have the basis for a claim for shoulder injury compensation. Call now for immediate and free friendly advice on your accident and how much it could be worth today. START YOUR CLAIM NOW 01252354433 **We have a team of technical claims qualifiers who will speak with you and if you have, in our opinion, a valid claim we can refer your case to one of the personal injury solicitors on our panel. * Other costs could be payable. Our panel of solicitors are specialists in UK injury claims advice. Contact us today for expert advice to help you get the compensation you deserve. This website is operated by Friends Legal Limited.